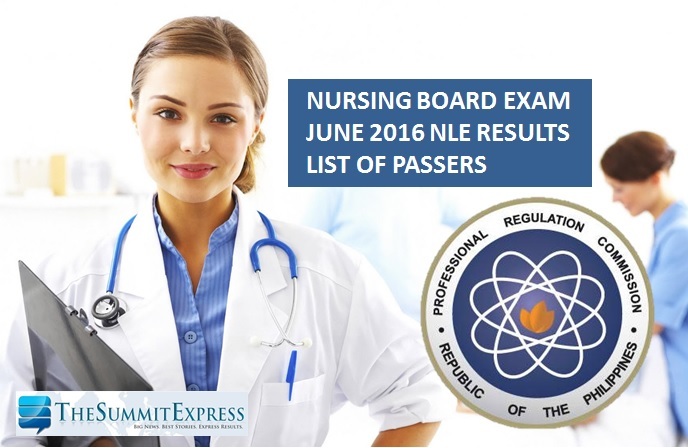 (Updated June 17, 2016) Those awaiting results of June 5-6, 2016 nursing board exam known as nurse licensure examination (NLE) can find here the complete list of passers, top 10 (topnotchers), top performing schools and performance of schools as the Professional Regulation Commission (PRC) and Board of Nursing (BoN) released complete results in just 9 working days from the last day of exam. The full list of passers for Nurse Licensure Examination is available on this page. PRC on Friday, June 17, announced that 6,183 out of 14,184 passed the Nurse Licensure Examination. The results of examination with respect to two (2) examinees were withheld pending final determination of their liabilities under the rules and regulations governing licensure examination. UPDATED: Here are the June 2016 NLE Results - now available online. The recent NLE was conducted in various testing centers nationwide: Manila, Bacolod, Baguio, Cagayan de Oro, Cebu, Davao, Iloilo, Legazpi, Lucena, Pagadian, Tacloban, Tuguegarao and Zamboanga. The members of the Board of Nursing who administered the licensure exam are Carmencita M. Abaquin, Chairman; Perla G. Po, Gloria B. Arcos, Carmelita C. Divinagracia, Carfredda P. Dumlao, Glenda S. Arquiza and Florence C. Cawaon, Members. The June 2016 NLE covered the following topics: Nursing Practice I (Basic Foundation of Nursing and Professional Nursing Practice), Nursing Practice II (Community Health Nursing and Care of the Mother and Child), Nursing Practice III (Care of Clients with Physiologic and Psychological Alternations - Part A), Nursing Practice IV (Care of Clients with Physiologic and Psychological Alternations - Part B) and Nursing Practice V (Care of Clients with Physiologic and Psychological Alternations - Part C). According to PRC, the target date of release of NLE results is on Tuesday, July 5, 2016. The big day falls in 32 calendar days or in 21 working days after the last day of exam. The computed number of working days excludes Saturdays and Sundays. In May 2015 NLE, results were announced in just 16 working days. A total of 9,707 out of 17,891 (54.26%) passed the nursing board exam. In November 2015, results were out online in 24 working days. PRC named 9,114 out of 18,500 (49.26%) who have passed the exam. The Summit Express expects that results are out online between June 17 and July 8 or in 12-24 working days. TheSummitExpress has partnered with PRCBoardNews.com to deliver updates before the official release of NLE results. We will update this page once we got reliable information from our sources. In the previous board exams, takers can expect exact release date of results by always visiting this site. It's also possible that PRC will release results on earlier date than our expected timeline if there's an improvement in the PRC system of checking of results. On Monday, reliable source for giving NLE results exact release date Dr. Carl Balita shared his good news and first riddle to all the takers. "When the baker counts the dawns with his dozen, from the day that the challenge to a privilege begins, the DREAM and the DREAMER will become ONE." With this, results are expected to be out online on earlier date or possible on June 18. June 14, 2016 Update: NLE results are expected from June 15 to 17, according to a hint from reliable source. June 17, 2016 Update: NLE results expected to be released anytime today. Stay tuned. Refresh page for the updates.